Anton Evangelista is an award-winning New York-based filmmaker who has spearheaded the Foundation's project to capture the personal stories of the Sousa Mendes visa recipients on film. A graduate of the High School of Art and Design in New York City, he founded his production company Comprehensive Films in 1994. 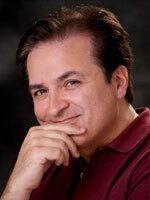 His directorial credits include Just Laugh!, a documentary on the healing effects of laughter featuring Regis Philbin and other celebrities, and Umberto E, a tribute to the filmmaker's father that tells a story of personal triumph, in which love and forgiveness serve as weapons of "revenge."